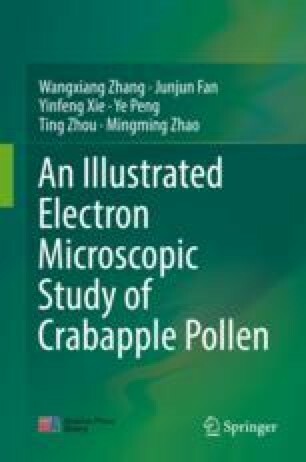 Nine phenotypic traits were assessed by field emission electron microscopy to explore pollen variation in various Malus species and cultivars. Phylogenetic reconstruction showed that the resulting molecular tree coincided with classical taxonomy. No distinct pollen evolutionary pattern was observed in Malus spp., except for exine ornamentation, which showed the evolutionary direction of large to small ridges. Based on the frequency distribution function, all traits except for P/E0 (polar axis/equator diameter) exhibited changes from species to cultivars. The direction of alteration was as follows: big to small pollens; elliptic to rectangular morphologies; large and compact to small and sparse ridges, and high to low perforation densities. The degree of alteration was as follows: pollen size and shape > exine ornamentation, and equatorial direction > polar direction. Boxplot analysis indicated that only three traits—E1/2/E0 (E1/2, equatorial diameter at 1/4 of P), ridge interval, and perforation density—exhibited significant differences, and the direction of alteration was the same as that shown by the frequency distribution function. Our findings suggest that pollen phenotypes are not sufficient in revealing the evolutionary pattern of Malus spp. However, the frequency distribution function was more precise in revealing both the direction and degree of alteration among populations.